This road/track (it's called a road but is really a track) was built by Len Beadell in the 1960's but differs from his normal strategy of building roads "gunbarrel" straight. This one is very winding and "periphrastic" (even Janet had to look that one up, it means speech or writing that is tortuous, indirect or circumlocutory. I think it applies to the SBJ road too). 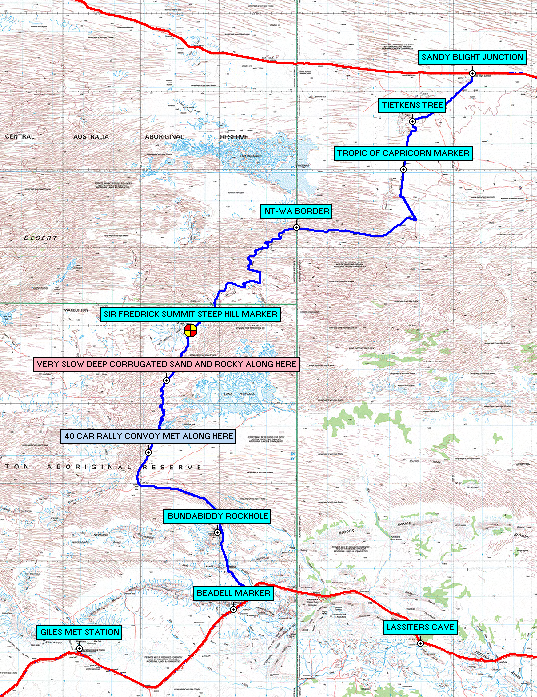 On the map it doesn't look very long, a tad over 200 kms as the emu flies, (from south to north, and presumably the same flying back the other way), linking the Great Central Road near Giles to the Gary Junction Road which runs west from the Tanami Track just north of Alice Springs. However, while it is quite scenic, the track at ground level was very winding, and at nearly 400 kms, much more tortuous than we were expecting. Our first surprise was that Len Beadell's Sandy Blight Junction Road marker tree is actually 9 kms from the start of the current track, due to subsequent track realignment. Once located, the first 70 kms or so of the track are quite reasonable since it leads to an Aboriginal community at Tjukurla. Thereafter the road becomes a 2 wheel desert track which winds through hills and sanddune country for a further 300+ kms. It is alternately very rocky and rough, or deep corrugated sand. It's the sort of track for which a sports bra is highly recommended. As we started the 2 wheel track section we were met by a couple of rally cars, then a few more, and finally lots of rally cars, 40 (yes forty, four-zero) cars, separated by about a km, all coming down the same 2 wheel tracks up which we were trying to navigate. After pulling off the track for each of the first dozen or so, we gave up and stopped for lunch until they had all gone past us. They all had their CB's on full blast and we were well known to all of them by the time they had all slowed down to say "Hello" and pass us by. They were apparently doing a Brisbane to Longreach charity rally, the long way round. How they navigated through the deep sand in their road cars is a mystery, although the last one was being towed. The 400 kms took us 3 days and eventually I was quite looking forward to reaching Sandy Blight Junction, especially during the final 25 kms dead straight section which seemed to take forever. Along the way, however, there are quite a few interesting points. Bundabiddy Rockhole was found by Len Beadell in the Walter James Range, and we found it too, about 1 km off the track. Being in the dry season, it was in a worst state than how Len Beadell described it. He went swimming in it while surveying the track and boasted how he'd been "swimming in the desert", but now it's slimy green and surrounded by animal droppings. A useful water supply, nonetheless, in an otherwise waterless desert. About halfway along the track, at 124 miles, is a tree blazed by len Beadell with a Half Way marker, as if to give some hope to tired travellers that they were actually making progress. A bit further along is a sign to a track to the summit of the Sir Fredrick Range, complete with dire warnings of VERY steep grades and GPS coordinates for the emergency (read "chickening out") turning round points. We chose to stay of flatter ground but we have heard of others having to make 15 point turns on a near vertical track to backtrack. We camped soon after this and I turned off the track to find a suitable spot. I was about to turn around when something stopped me and we stayed where we were. When I got out to look around, I found a deep hole right behind where I was about to reverse. It gave me nightmares all night thinking about how I would have got the Oka out if I had dropped a wheel (and axle) into that hole. Janet placed a rusty oil drum in front of it to remind me NOT TO DO IT. At 140 miles there is another Len Beadell marker, apparently for no other reason than it was 140 miles from Giles. At the 200 mile point (from the Great Central Road), Len Beadell located a large rock which is painted white to mark the 200 mile point. It's still there but as Len pointed out, it's relevance was rendered worthless with the introduction of metrication into Australia. Just before the 200 mile rock, we took a shortcut across some sanddunes to avoid a 5 km trip to go around them. Well it might have been shorter in distance, but since we got stuck on one, it wasn't shorter in time. I had trouble getting over the sanddune with tyre presures set for rocky ground so we had to reverse off, drop the pressures even further and then try again, this time successfully. All good fun. As we crossed the Tropic of Capricorn, suddenly nothing happened, none of the usual signs were there. They were a few hundred meters up the track. Apparently, at some time in the past 50 years the location of the tropics has been re-computed which means all the old signs are now in the wrong place. We have found this on several outback tracks which cross the tropic. Towards the end of the track is another Len Beadell marker, this time the rediscovery of a long dead tree which was blazed in 1875 by William Harry Tietkens, an early explorer in WA and second in command to Giles in his expeditions. The tree is now dead and fallen over but the inscription has been preserved. Visit http://adbonline.anu.edu.au/biogs/A060295b.htm for a biography of Tietkens. On the side of the track we found a recently abandoned trailer, still with all it's wheels, jerry cans and some food, still fresh. It was in pieces and only the axle is missing, presumably the reason for it's demise was bearing failure. It had a sticker on it from Yulara camp ground dated 9th July, only 5 days before we found it. It might have been left by the rally group we saw earlier, but we have found so many trailer wrecks or broken down trailers needing assistance we wish people would get the message: "Don't take trailers on outback tracks." They can't take the rough conditions, even so-called off-road trailers. On our last day on the track we had to do some washing. We stopped for lunch in the middle of the track, since we had seen no one for 2 days and hung the washing out across the track to dry. Five minutes after taking in the dry clothes, a 4WD from the Aboriginal community roared past, the first vehicle we'd seen since the Great Rally Car convoy. Just lucky I guess. When we reached the end of this track at Sandy Blight Junction (after which the track was named) it was high fives all round for getting through it. It had been tougher than expected but we had made it. It was not surprising to see the road sign at this end grandly announcing "4 WHEEL DRIVE ONLY". There was no similar sign at the other end, only a rusty car bonnet on the side of the road near Tjukurlka with "4wd" scratched on it. And the 340 kms was a tad optimistic too, we did nearly 400 kms, and Docker River is a further 25 kms from the start of the track anyway. Len Beadell's marker at Sandy Blight Junction shows the distance to Giles as 252 miles, which is 405 kms. But overall it was a good drive and well worth the effort. We had no hassles getting permits, we applied on-line and had them emailed back to us in a couple of days. The graphic below shows our average speed profile on this track, around 50 kph on the first section, dropping to 25 on the sandy/rocky sections and then speeding up again as we approached the end. There are more Len Beadell markers to the square meter on this track than we have seen on any other, 10 apparently, although we didn't count them all. Did he have time to kill, or spare aluminium plates to use up? It's not as though the track was easy to build, it would have been quite difficult compared with his normal straight and level tracks. And it wasn't likely to be a highly used track, his most frequented tracks are east-west. But the intrigue continued. 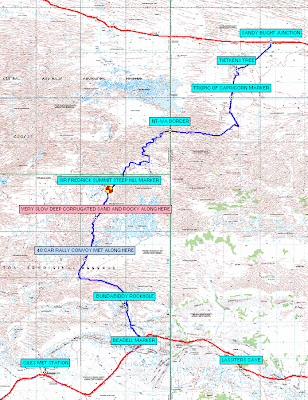 For some unaccountable reason, Len Beadell's party actually continued the track for a further 37 kms into uncharted desert areas for no apparent reason. The track actually stops in the middle of a huge area of sanddunes with no obvious destination in sight. The faint red line winding north on this map stops abruptly in a mess of sanddunes. Why? Was he beaten by the difficulties presented by the sanddunes? Not likely, Len Beadell was never one to give in. Was he aiming for the Aboriginal community at Nyirripi, 85 kms to the north east, and thus close the loop to Yuendumu on the Tanami Track? On Len Beadell's original marker plaque (see below) which is now located at Giles, with a replica at Sandy Blight Junction, he shows a track north to Vaughan Springs, but with no distance marked, just a blank space then "M" for miles. 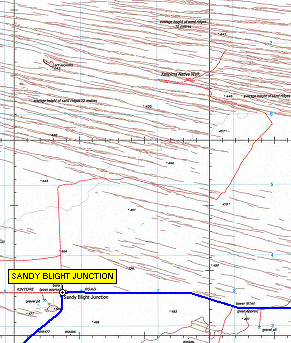 Vaughan Springs is 50 kms north east of Nyirripi in the Treuer Range, so the theory that the Sandy Blight Junction Road was eventually intended to link up with the Tanami Track seems entirely plausible. Like his other tracks, Beadell would put up plaques as the roads were built and then come back subsequently to mark actual distances on them after they were finished. This plaque was never completed. But why was the track to Vaughan Springs not completed? Maybe he was getting beyond his main geographic area of activity and was called back to more pressing work? One other school of thought is that the Gary Junction Road was originally going to be located further north, but was subsequently re-routed further south. Sandy Blight Junction would thus end up where it is now, south of the actual end of the track. That would leave the top end of the track unused, and explain the conundrum. We took our Off-Road trailer, a Scruby, made at Ulladulla, and had no trouble. 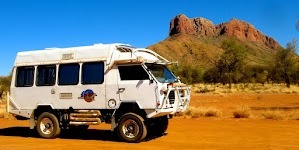 It has been to Cape York, The OOdnadatta Track twice, the Plenty Highway, Birdsville, Robinson Gorge, across the Trans line from the Stuart Hwy to Cook, and 100km N then down to the Eyre Hwy, Kalgoorlie to Zanthus, and S to Balladonia, and 1000s of kms on other track, including the bottom of the CSR, where we saw 2 other trailers who had just completed the CSR. I dont know what your problem is with trailers? You had trouble with your Universals, and we had none with the whole 60 Series, and a 'roo bar that didn't rattle. Speleo, I don't have a "problem with trailers", I have one myself, but it's not suitable for outback travel. I am just reporting that on just about every track we've covered (in 110,000km of outback travel), we've come across broken and/or abandoned trailers. We recently (July 2012) completed the David Carnegie Road, Eagle Highway and Talawana Track and sure enough we came across 2 more abandoned trailers. There must be a message there.